Comments: In Kenner?s vintage Star Wars line, the Weequay action figure was in a daring action pose. In fact, this figure was the most extreme example of action posed figures back in the day, and you know what? He could still fit in every vehicle included in the entire 3 3/4 collection! Crazy that. 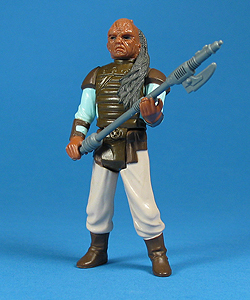 Major Variations: Though all vintage figures have minor variations, the Weequay action figure has no major variations.